Members of RMT Central Line West and HOLT demonstrated outside Shepherd's Bush tube station on Thursday 8th January between 17:00 and 18:30. Capturing the busy crowds and the shoppers, commuters and members of the local community. A number of passengers voiced their concerns that the ticket office is scheduled to close in February 2015 and that the Mayor has lost his mind (if he had one to start with). 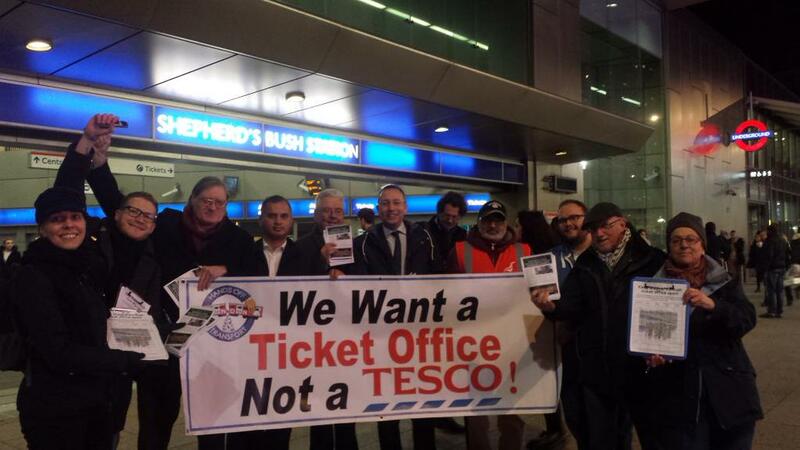 They then went on to sign the petition to keep the ticket offices open. Whilst demonstrations were ongoing, the queue for both windows of the ticket office and machines were eight people deep. Proving even now that there is still a need for a ticket office, but we know that!